Nov. 15, 2013: What are the odds? On Nov. 18th and 19th not one but two comets will fly by the planet Mercury. On Nov. 18th Comet Encke will pass within 0.025 AU of Mercury, followed a day later by Comet ISON at 0.24 AU (1 AU is the distance between the sun and Earth, 150 million km). The MESSENGER spacecraft, which is orbiting Mercury, will turn its sensors toward the passing comets for a point-blank investigation of both. The double flyby is exciting, says Vervack, but "it makes things a little crazy. 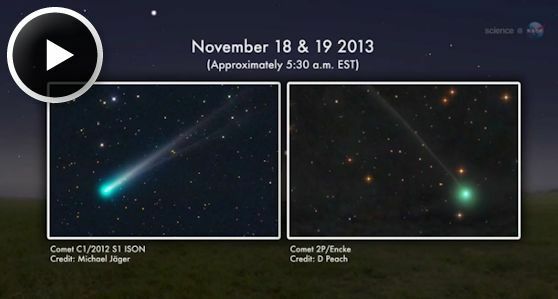 We have to rush to complete our observations of Comet Encke, then do it all over again for Comet ISON. Everything is happening at more or less the same time." MESSENGER was designed to study Mercury, not comets, “but it is a capable spacecraft with a versatile instrument package,” he adds. “We hope to get some great data.” Onboard spectrometers will analyze the chemical makeup of the two comets while MESSENGER's cameras snap pictures of atmospheres, jets and tails. Comet ISON is already a media favorite. Astronomers have been tracking it since Sept. 2012 when it was discovered on a trajectory that would take it perilously close to the sun. On Nov. 28th of 2013, Thanksgiving Day in the USA, Comet ISON will pass through the sun's atmosphere little more than a million kilometers above the sun's fiery surface. If the icy comet survives, it could emerge as a beautiful naked-eye object for observers in the northern hemisphere. MESSENGER’s glimpse of Comet ISON as it plunges inward could give astronomers the data they need to predict the comet’s fate. Comet Encke is less well known, but no less interesting. For one thing, it is the source of the Taurid meteor shower, a slow display of midnight fireballs that occurs every year in early- to mid-November. Comet Encke dips inside the orbit of Mercury every 3.3 years, so it is regularly exposed to solar activity. In 2007, NASA's STEREO spacecraft watched as a solar storm ripped off Encke's tail--which promptly grew back: movie. 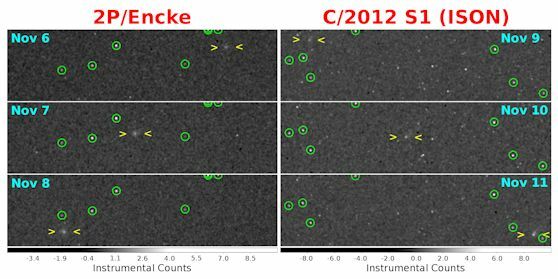 "We'll be catching Comet Encke just days before its closest approach to the sun (0.3 AU)," Vervack says, "so we get to see it at its most active." Ironically, the fact that MESSENGER is designed to study a rocky planet could prove advantageous for the icy comets. MESSENGER's x-ray spectrometer, in particular, could detect signs of ‘comet dirt’. "We hope to obtain the first definitive detections of x-ray emissions from silicon, magnesium and aluminum," he explains. "If you think of a comet as a dirty snowball, these are elements that make up the dirt. Close to the sun is where we expect the dirt to be vaporized." In total, Vervack expects MESSENGER to gather 15 hours’ worth of data on Comet Encke and another 25 hours on Comet ISON. With that kind of observing time, discoveries are a distinct possibility.